Salisbury is a town in Merrimack County, New Hampshire, United States. The population was 1,382 at the 2010 census. 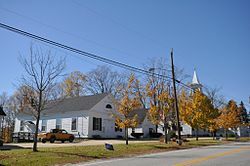 While still part of Massachusetts, the town was granted as Baker's Town after Captain Thomas Baker in 1736. After the border between Massachusetts and New Hampshire was fixed, the town was on the New Hampshire side of the border. It was re-granted by the Masonian proprietors in 1749 with the name Stevenstown, and settled as early as 1750. Additionally known as Gerrishtown and New Salisbury, the name Salisbury was taken when the town incorporated in 1768. According to the United States Census Bureau, the town has a total area of 40.2 square miles (104.1 km2), of which 40.0 sq mi (103.6 km2) is land and 0.3 sq mi (0.8 km2) is water, comprising 0.65% of the town. The highest point in Salisbury is along its western boundary, where the eastern slopes of Mount Kearsarge climb to 1,910 feet (580 m) above sea level. The Blackwater River, part of the Merrimack River watershed, runs through Salisbury. A popular fishing and recreation spot is The Bay, a natural lake-like section of the river. As of the census of 2000, there were 1,137 people, 435 households, and 324 families residing in the town. The population density was 28.5 people per square mile (11.0/km²). There were 514 housing units at an average density of 12.9 per square mile (5.0/km²). The racial makeup of the town was 97.80% White, 0.70% African American, 0.26% Asian, 0.09% Pacific Islander, 0.18% from other races, and 0.97% from two or more races. Hispanic or Latino of any race were 0.70% of the population. There were 435 households out of which 31.7% had children under the age of 18 living with them, 69.0% were married couples living together, 4.1% had a female householder with no husband present, and 25.3% were non-families. 17.0% of all households were made up of individuals and 6.2% had someone living alone who was 65 years of age or older. The average household size was 2.61 and the average family size was 3.00. In the town, the population was spread out with 24.5% under the age of 18, 6.1% from 18 to 24, 28.2% from 25 to 44, 31.1% from 45 to 64, and 10.0% who were 65 years of age or older. The median age was 40 years. For every 100 females, there were 103.4 males. For every 100 females age 18 and over, there were 96.3 males. The median income for a household in the town was $55,000, and the median income for a family was $62,321. Males had a median income of $36,991 versus $28,462 for females. The per capita income for the town was $23,112. About 0.6% of families and 1.9% of the population were below the poverty threshold, including 0.7% of those under age 18 and 4.6% of those age 65 or over. ^ Coolidge, Austin J.; John B. Mansfield (1859). A History and Description of New England. Boston, Massachusetts. pp. 641–642.